About one-quarter (24.24%) of all search queries conducted via Google are for local goods and services, according to a study by Chitika Insights. However, Bing and Yahoo users are more likely to conduct local search queries: 28.81% of queries conducted via Bing are local searches, as are 25.28% of queries via Yahoo. 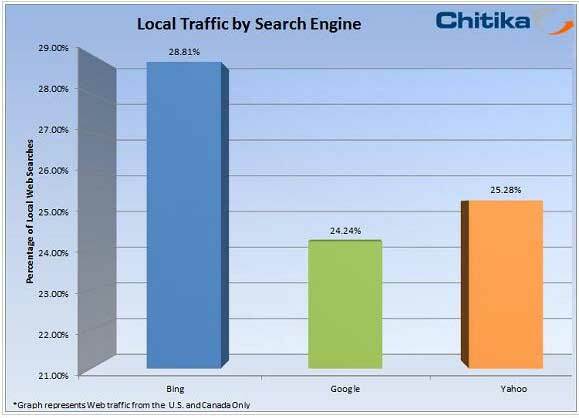 For the study, Chitika Insights studied millions of ad impressions* across the US and Canada served via the three search engines (Bing, Google, and Yahoo), September 21-27, 2012.